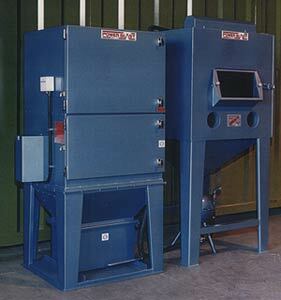 Power Blast manufacture a range of pressure operated cabinets. These are substantial, robust units (not to be confused with suction fed cabinets), are rubber lined internally and supplied with heavy duty perforated plate flooring. 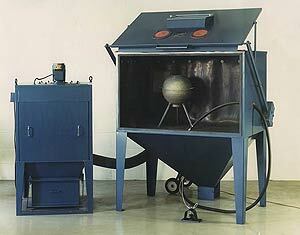 All are fitted with Power Blast Machine and Dust Collector capable of handling the most contaminated cleaning operation. (1520 x 915 x 915). 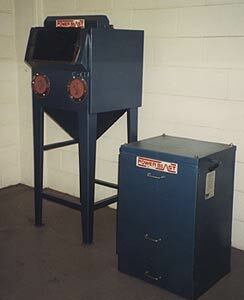 A spacious blast chamber for large components, abrasive recycling directly into Power Blast Machine or with Bucket Elevator (illustrated) for floor level operation. Model 3330 size 3'0 x 3'0 x 2'6"
(915 x 915 x 760) popular model fitted with Power blast 1A Machine and load end with rotary table. 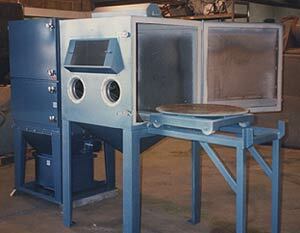 (915 x 915 x 915) heavy duty unit fitted with Power Blast 1A Machine for floor level operation. (610 x 610 x 610) smallest of this range for light components and small workshops, fitted with Power Blast 1A Machine for floor level operation. For further details and prices of these or any other size cabinet (please advise sizes, component weights etc.) please call or use our contact page.